Charlie Hebdo’s decision to publish a fresh depiction of the prophet Muhammad follows a week of polarising debate around notions of free speech in the wake of a terrorist attack against the magazine seeking to “avenge the Prophet” after earlier depictions were published in 2011. The latest front cover depicts the prophet Muhammad shedding a tear and holding a sign of solidarity with the victims that reads “Je Suis Charlie”, above the text reads “All is forgiven”. But a lesser known depiction of Muhammad, which does not rely upon caricature exists in the United States. Inside the walls of the U.S. Supreme Court, perched above the press seating area is the North Wall frieze dedicated to the “great lawgivers of law” to portray the development of law throughout history – and one of the figures immortalised is the prophet Muhammad. A frieze built between 1931 and 1932 in time for the buildings grand opening in 1935. Justinian, Charlemagne, King John, Louis XI, Hugo Grotius are in close proximity to Islam’s prophet. Other famous individuals depicted include Sir William Blackstone, Napoleon, Confucius and Octavian. In 1997, a coalition of 16 Muslim organisations asked for the frieze to be altered “in the spirit of religious tolerance and pluralism” due to the ‘Islamic tradition of not depicting faces’. The campaign failed its main goal but it did help correct an error that listed Muhammad as the “founder” not “prophet” of Islam. 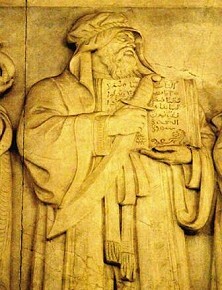 Others complained that depicting Muhammad with the Qur’an in his left hand (considered unclean) furthered the insult. One of the organisations who originally petitioned, the Council on American-Islamic Relations (CAIR), now considers the issue behind them and now acknowledge the Supreme Court’s good intentions. A fatwa issued by Sheikh Taha Jabir al-Alwani concluded “What I have seen in the Supreme Courtroom deserves nothing but appreciation and gratitude from American Muslims”. Nor must we discount the historical tradition of depictions of Muhammad in Islamic art. According to Islamic scholar Jonathan A.C. Brown, the earliest depiction of Muhammad dates back to a mid-thirteenth-century Persian poem, depictions also became commonplace in Turkey, India, Iran, and Central Asia during the 13th and 16th centuries. Other visual depictions are found in certain books.